But it is not the lamppost or lantern I want write about. It is the flower garden at its base. Years ago, we planted some tulips in that area and enjoyed watching them emerge early every spring. We abandoned that practice because the tulips usually came and left before we opened. Every now and then, a single or just a few yellow tulips still bloom in the early spring for us to enjoy for short while. Then, around Mother’s Day, when we are comfortable that the lasts frost of the season has come and gone, we dig up and till the ground and plant new flowers for the season. This spring, another single yellow tulip came up and was joined by four bright red tulips. We were stunned. We have no idea how long those bulbs had been in the ground and certainly couldn’t remember when they last bloomed. Somehow, they survived all the years of tilling and working the ground in that small garden area. But there they were, standing tall and proud. Spring brings surprises. Isn’t that just like spring? New life appears and overtake the dark and drab coat of winter. It’s like screaming “A new day is here…come marvel and enjoy”. But isn’t that life also? Sometimes wonderful and beautiful things hide just out of sight, waiting for the right time to make its appearance. It may be quickly, or it may take years, like our red tulips. Granted, sometimes these surprises may not be welcome. The news may be an unexpected set back or perhaps a medical issue. But even those times can be a wakeup call for us to change direction or to modify our lifestyle or behavior. Maybe our real lesson is to be aware of what is around us and to realize that changes and surprises that may suddenly appear. Perhaps we should even be looking for those new and exciting things hidden from view under a thin layer of soil, just waiting. We may be surprised when we really open our eyes as well as our hearts and minds to the possibilities. I can’t close without a thinly vailed attempt at marketing. Most of you reading this have been to Hemlock Inn. If so, you can stop reading now. BUT if you haven’t, Hemlock Inn can be one of those hidden gems. We sit off the beaten path, away from traffic, crowds, on 57 wooden acres. We have spectacular mountain views and provide wonderful home cooked meals along with a healthy dose of peace, quiet, and friendly folks. You may come not knowing what to expect and discover a bright red tulip. This winter has been a season of learning for me. It has also been a lesson in patience, perseverance, and frustration. Late last year, I was notified that the only on-line reservation system we have used had been sold to a large international company. We had to either convert over to the new company or set up with a completely different company over the winter. I must first explain that our old system was not a “real time” reservation system. It was merely a way folks could request a reservation. We could accept or deny the request, but we had complete control over the process and some discretion on how we would handle the request. I quickly discovered all this was going to change. The new on line procedure makes and confirms reservations, based on availability we provided, in real time and without any consultation from us. Now, for many of you, this is completely understandable and expected in today’s online process. This is standard operating procedure. But we always liked to be in touch with potential guests, find what they wanted, make suggestions, and help them complete the reservation. Now, travelers seek and find their destinations on line, pick out a room, enter their credit card information, and the reservation is confirmed….instantly. So, I started the conversation process and immediately ran into problems. I could not find a way to describe our inn. Instead, I was given a list of options and asked to click on the one that best described the type us. I could choose from B&B, resort, hotel, cabin, yurt, beach house, lakeside home, elegant townhouse and so many more. But there was no option for what we have called ourselves for 67 years, a COUNTRY INN . There was no option to indicate that our room rate includes full country family style breakfast (not buffet, not continental, not a la carte) or our hearty southern family style dinner. In short there was no flexibility on many items. I had to choose and describe our inn by selecting cookie cutter options. The company wasn’t very helpful or available to help either. I decided to select another online system that was a little less stringent. They were more helpful, but I still had to invent ways to fully describe our operation. But my task was not complete. I also decided to add three On Line Travel Agencies (OTAs). You know them. They advertise all day long on TV. That’s right, I am moving into the 21st century. I have finally understood that these platforms are the ones constantly used by all travelers, not just the young ones. In my heart I knew this would have to happen and that it will increase our visibility and attract more guests. It is a new world where we will have less and less contact with potential guests until their actual arrival. This process has taught me two important lessons. Number one, I am old and out of touch. Number two, we need to address the question of who we are in today’s terms. If folks don’t know about Country Inns, we need to figure out what they recognize and how to adapt. It is sad to me that folks don’t seem to know about country inns. For a while now, I have noticed that many newer guests refer to us as a B&B. Country Inns have been around almost as long as our country. They were prominent in New England in the 1700s as a place for travelers to stop. The main feature that distinguished them was the food. Country Inns served big breakfast and bountiful dinners. Some served a lunch as well. It was a one stop destination for tired travelers. Norman Simpson formed an association of his favorite inns and wrote a travel book entitled “Country Inns and Backroads” that was published for many years. He loved to tell of the unique inns that were located off the main roads, usually in somewhat remote areas. Upon his death, his association of Innkeepers stayed together, but slowly was overtaken by a new breed of lodging; the Bed and Breakfast. The B&Bs were usually much smaller, only offered breakfast, and many times were quite elegant. This was a far cry from the Country Inn. 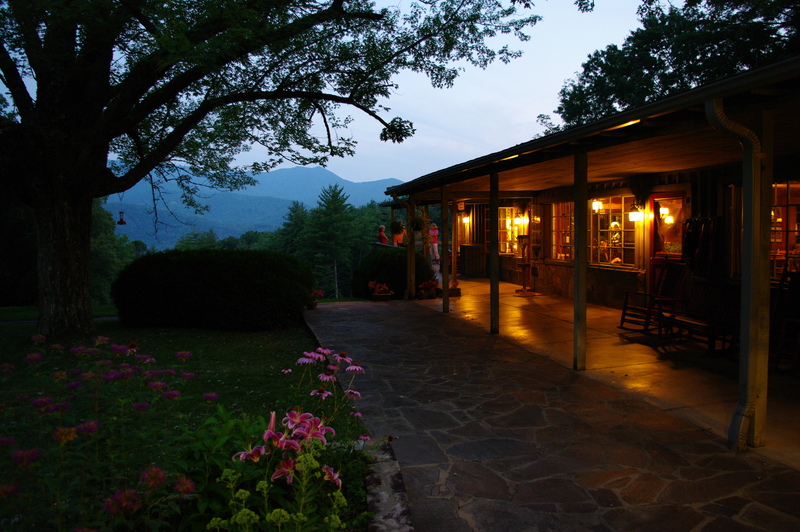 Hemlock Inn sits on 57 wooded acres near the Great Smoky Mountains National Park atop a peaceful mountain. We have beautiful mountain views, southern style meals, and quiet nights filled with gentle voices and the sound of crickets. We are a Country Inn…. For the past several years, I have employed a local gentleman to keep up our yard. In the Spring and Summer, he mows the grass and weed eats down the banks and along the edges. As fall approaches, his attention turns to blowing and raking leaves. Since we are located on 57 wooded acres, we have a lot of leaves falling. This is a never ending, thankless task for often they fall faster than we can collect them. I have a picture in my mind of a former employee going down the driveway blowing the leaves as fast as he could. The immediate area he was blowing was clean and neat; in front of him the driveway was covered with leaves, and behind him they were falling heavily, covering what he had just blown. I asked him if that was frustrating for him to work so hard only to have his work covered backup with leaves so quickly. He just laughed and that was his “job security”. My yard worker and friend was suddenly and unexpectedly diagnosed with a rare cancer that incapacitated hem quickly and took his life in just a few short months. It shook up all of us. His son graciously offered to continue his work for the rest of the year. The only drawback was he already had a full-time job, so it was going to be bit more complicated than before. But we greatly appreciated his offer and quickly accepted. As you may have also experienced, our fall was slow coming and slow to end. Usually, all, or at least most, of the leaves have fallen by the end of October or early November. Our peak weekend this fall was not even until the first weekend of November and the leaves lingered on the trees for a long time afterward. I wanted to make sure the last of the leaves had fallen before he came do a final cleanup so I asked him not to come for a while. I finally called him in mid-December and told him to come do a final cleanup. But his job interfered and he had problems getting here. After the holidays, I contacted him again and told him that since the inn was closed, I had time to do it. I was not disgruntled with him (it was not his fault). I just like to get out and do tasks like this. It keeps me active and clears my mind. I have made many business decisions and written several blogs (including this one) while outside doing jobs or hiking. After the rains and snows finally slowed down, I began my task. I planned to work just a few hours at a time. I was in no hurry, but I wanted the place nice and clean. My goal was the blow and rake up around the inn the first week. Blowing out the gutters, the parking lot, and around the Innkeepers, Rondette, and Woody Cottage. I found that over the year, many leaves had simply found there way under all those boxwoods and settled into low areas. While the top layer was dry and easy to move, the layers underneath were still wet from all the rain ad snow we had in December. The leaves were ankle deep around the Woody Cottage and in front of the Rondette. They could not be blown easily. The only way I found to move them was to rake them onto a canvas tarp and physically drag them somewhere out of the way. Which brought up another issue. Where do you put all the leaves you collect? Years ago, we had a guest ask that very question. We laughed and thought that was a dumb question. But I found it was a real issue. I blew and raked leave over the many banks we have as much as possible. But at some point, I had more leaves than I had places to put them. My mind started wondering just how many leaves I was moving. When I first began, I thought how many thousands were there? It didn’t take me long to figure it wasn’t thousands, it was millions, billions, even trillions of leaves. In retrospect, I guess I should have just piled them up and burned them all, but that thought came long after I had already pushed most over a hillside. 2018 was a good year! We met many new wonderful guests, enjoyed so many happy hours with familiar guests, friends, and with family. Sadly, we lost a few also, but smile as we remember the special times we shared with them. We are blessed at Hemlock Inn to have the opportunity to be a part of so many folks’ lives. As we passed into 2019, we entered a special anniversary year for our family. In early 1969, John and Ella Jo Shell purchased Hemlock Inn from Raymond and Georgia Johnson. For the next 20 or so years, they managed the inn as it grew and attracted more and more guests. In 1989, their daughter/my wife, Lainey and I came on board and eventually took over operation if the inn. 2019 marks the 50th anniversary the inn has been a part of the Shell/White family. We intend to commemorate this anniversary throughout the year; remembering our history, growth, experiences, and special guests. Ironically, John Shell, who lives with us at the inn, will also celebrate his 90th birthday at the close of this year. He will be around as much as he is able to tell his tales as no one else can. I also plan to host regular “Evenings with the Innkeeper” after dinner to share stories of our history, our guests, the unique life of an innkeeper, and even some amusing events over the years we’ve encountered. Keep following our blog for more details…. I hope you can come join us for this season and help us celebrate Hemlock Inn. We are so grateful to each of you because each of you is a part of our history and story. We hope to see you soon. Several of you have contacted us recently about the effect of the Hurricane Florence on Bryson City and our inn. This has been a very trying and emotional week for all of North and South Carolina. Words cannot begin to express the destruction and pain that storm has brought upon our region. The very western part of the state, everything west of Asheville, was spared any major impact. The storm, after lingering on the coast for several days and then slowing working its way inland, turned northward up through Asheville and out of the area. Everything east of Asheville experienced mammoth rainfall and winds. Everything west of Asheville was essentially unscathed. While we are grateful for our good fortune, we cannot celebrate because so many others have and are still suffering. We appreciate your concern and ask you continue to pray for those in the eastern portion of our state and of South Carolina, especially those on the coast. This will be a long recovery for them. Ironically, we are entering into the most beautiful seasons of the entire year in our mountains. We are already beginning to see of leaf color change in some sourwoods and our dogwoods. With all the rain this year, we expected a beautiful fall. 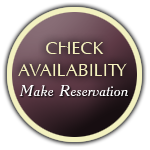 We still have rooms available, especially during the week, and invite you to make a reservation and come see us soon. We cherish your friendship and pray you are well and happy. We can’t wait to see you. Yes, it has happened again. We had a guest check in with pictures of his family’s visit at our inn in 1967. He and his wife spent considerable time looking through our old guest’s sign in books, looking at our numerous albums of pictures, and plowing through our inn’s historical books. They were obviously looking for connection from 50 years ago and they found it. He gleefully walked into our office announcing “I found it….their actual signature in the register book” . Sometimes, when we least expect it, we remember good times from our past. Then we begin crave those good times, and ultimately start to search how to reconnect with them. We yearn for simpler times, a slower pace, and a little bit of the peace and quiet of bygone times. But life often moves so fast that it is all we can do just to keep up with so many deadlines, schedules, obligations, and activities. We certainly cannot ignore reality and our responsibilities. But maybe, just maybe, we can escape for a while. Instead of constantly forging ahead at a breakneck speed, perhaps we just need to take a step backwards. It happened here this week and will likely happen next week and the next…. Some time back as I was checking out a guest, he mentioned that this was his family’s first communal vacation. I will admit that I didn’t know was he was talking about. He continued with “You know, dining with other folks and getting to know them”. Since I have been dining that way for the past 30 years at the inn, I had forgotten how unique we are in that regard. Each vacation spot looks for a way to define itself and for “that something” that sets them apart from other locations. It can be luxurious accommodations, fine dining, grand size swimming pool and spa, championship golf course, business center, or any number of other amenities. For Hemlock Inn, it comes down to a beautiful mountain view, friendly atmosphere, and those meals. The meals are great (a biased point of view of course) consisting of genuine and plentiful homestyle cooking, but it is the way it is served that is special. We have five large lazy susan tables that are loaded down every morning and evening. A bell is rung and everyone descends upon them all together….communally if you will. A blessing is given and the fun begins. The tables themselves are a story. Seth and Lorraine Haynie, builders of the inn, owned the lazy susan table that sits in the center of our dining room. They brought the table up with them when they opened the inn simply because they had nothing else to do with it. They thought most of the guests would sit at other smaller square table they also brought. They were lab tables from Emory University and were perfect for a couple or four guests and would offer privacy and perhaps even intimacy. But a strange thing happened. Most of the guests wanted to sit at the large round table. The Haynies quickly contracted a craftsman from Maggie Valley to initially build two more large round lazy susan tables, and eventually four. It is almost magical to watch the dynamics around the tables once the meals begin. Commonality is discovered, stories are told, laughter begins, and friendships are formed. It is heartwarming to witness folks in actual conversation with no thought of tweets or instant messaging. It is face to face sharing and listening to each other that brings the comfort of grandmother’s table. Many years ago, I was once asked if I would ever have online reservation system. At the time, I replied I didn’t really want to let someone make a reservation without personally talking with them. I didn’t want anyone showing up and being surprised how we operate and how we dine. A guest asked me at the time, “What if someone wants to make a reservation, but is uncomfortable talking with anyone?” I thought for a minute and then replied, “Well I guess they would not be too happy here”. Of course, I had to eat my words and set up an on-line reservation system. But I am still a little bit nervous when someone I have never spoken to checks in. I never want to put anyone in a spot where they might be uncomfortable. A number of years ago, our family went on a cruise. I was really looking forward to it. Lainey and I warned our boys that we would be having sharing a table at mealtimes with another family as is normal on many cruises. I told them “This will be great. We won’t be in charge or feel like we need to guide the conversation. We can just be laid back and enjoy the experience”. But my southern roots and innkeeping background got the best of me. We no sooner got to the table when I stuck out my hand and introduced myself, Lainey and the boys. Soon I was telling them where we lived, about Hemlock Inn, what we planning to do on the cruise and more. The other family sat quietly. They were very nice, but didn’t see the necessity share very much. At the end of the meal, we parted ways expecting to see them for the next morning at breakfast. In short, they never showed up again the entire trip. We ran them off. I guess not everyone wants a communal vacation. Summer is upon us and it promising to an exciting time in our mountains. We hope to see you this year and will be waiting for you! Our opening day is rapidly approaching…Wednesday, April 18. Our anticipation grows and we look forward to seeing old friends and making new ones. As always, the few weeks before we open are busy days as we spring clean and make repairs. But the days are also invariably filled with unexpected adventures and challenges. On Monday, the first day of cleaning, we discovered a drainage problem around our laundry area. We actually found this in February and thought we had it repaired. But when we started washing all the blankets, spreads, and shower curtains, the drain started backing up again…big time. An emergency call to a repairman that specializes in drains resulted in a day long search for the problem and suspension of all laundry. By days end, the problem was finally located and a temporary fix was done BUT a larger fix that involved tearing up part of the driveway would be necessary. Oh well, I thought, at least we have a plan. But the fun was just beginning. For Tuesday, we had arranged for a local plumbing company to install a new chlorinator for our water system and replace some shower valves in a few rooms. The chlorinator installation was quick and easy. The shower valves repair is a pretty straight forward, and the repair in the first room went smoothly. However, in the next room, they would have to cut through a tiled wall to create an access hole big enough to install the value. All went well until they discovered a three inch thick solid concrete wall (the inn was built in the 50’s you know). So the rest of the day was spent cutting and drilling through the concrete and removing the old valve. They ran out of time, so that job was suspended as well until the following week. In the meantime the water had to be cut off. So spring cleaning was not possible in that entire building. Good grief I thought, but it has to be done………..
Wednesday had to be better I thought. We planned to take up and replace some flooring in the kitchen damaged by a leaky dishwashing machine. In the middle of the night, a severe storm hit the area, blew down a tree on our property across the utility lines, knocking out all the power to the inn. The flooring folks showed up on time to a dark kitchen. The housekeepers showed up to dark rooms and no heat. The work for both was suspended for the day and I spent the afternoon cutting up the downed tree and cleaning up brush. Not what I panned for the day. I welcomed Thursday with some dread. The power was back on, the housekeepers were back cleaning rooms and the flooring folks were able to start their task. The old flooring came up easily as we expected, but underneath we found some old 1950s adhesive that could not be removed. We tried everything imaginable, but nothing was working. As we stood in the kitchen discussing options, my phone rang. The call was from the company that monitors our water system. He was calling to inform me that he had just replaced our chlorinator. Remembering the plumber has just installed one on Tuesday I screamed “Stop, I’ll be right there” and ran out of the room to the puzzled looks of the flooring guys and my wife. The water chlorinator has been a nagging problem for months. I knew I needed a new one, but had run into problems getting anyone to install one including the plumbing company and our water monitoring company. After months and months, they both came within two days of each other and our water company had just taken out a brand new chlorinator and installed his. What are the odds? As the week came to a close on Friday, The drain repairman had not come back to permanently fix the laundry drain issue or scheduled a time to do so. We were still waiting for the plumber to return and install the shower valve and turn the water back on. After months of delay, I had two companies install a chlorinator within days of each other and I subsequently discovers that neither of them worked. It had been quite a week. But truthfully, it was not unusual. This is the life of an innkeeper and while it can be irritating and frustrating, it is normal. I love innkeeping and this is just part of it. But there are also parts that include the bonds we share with our guests who become friends. It is sitting around a lazy susan table and enjoying the laughter and a good home cooked meal. It is giving weary people a place to experience nature at is very best and a quiet peace. It is offering a time to rest, refresh, and renew from the anticipation and adventures our week may have brought us. I wouldn’t have it any other way and there is no place I’d rather be than Hemlock Inn as your innkeeper. We will open Wednesday, April 18, and hope you will join us this season. I promise we will be ready! The winter months of January, February, and March are important times for us. The inn is closed and we use that time for rest and renewal before the new season begins in the spring. But the winter is also the time we use for repair, maintenance and projects. Last winter, we were able to repair a major water leak under the concrete slab floor in the kitchen, install new mini-split heating and cooling units in seven rooms, and replace carpeting with new hard wood laminate flooring in a few rooms. There is always a long list of leaks and drips, sticky doors, old door locks that require our attention. We sleep a little later, but it is not unusual to spend several hours a day just doing odd jobs around our 65 year off facility. Then there is the unexpected. These are the events that aren’t planned but come up and require attention. Sometimes these projects take on a life of their own. Lainey decided to paint the kitchen cabinets in our home. They look great, but it turned into a major reorganization of the entire kitchen. Some projects uncover more work than planned. I imagine you may have experienced that for yourself. In December, just as we were closing, I was heading to town for some reason in my 1998 green Ford Ranger pick-up. You cannot operate and inn without a pickup, so even though it is old and has 130,000 miles of wear and tear, it is a vital part of our operation. As I was pulling out of the driveway, I remembered our housekeeping staff telling me that a sink valve in the downstairs of Red Cottage was dripping. All it needed was a washer, but since we were closing for three months, I decided to wait until spring to have a plumber fix a number of jobs we had. So my plan was to just turn off the supply valve for now. I pulled up the steep one lane drive to the lower level of the Red Cottage. Since, I was just going to run in and turn off the valve, I left the engine running, engaged the emergency brake (or so I thought), left the 5 speed in neutral and hopped out of the cab, leaving the door open. I took a few steps and reached in my pocket for the door key when I noticed out of the corner of my eye some movement in the truck…..backwards. The level ground where I had stopped was apparently not so level, and the emergency brake I had set was apparently was just a figment of my imagination. The truck was picking up speed and heading straight down the steep drive heading toward Galbraith Creek Road and the trees beyond. My immediate response was to chase the truck, jump in the cab (after all, the door was still open) and stop the runaway vehicle. However, this seemed imprudent as the truck increased speed, veered off the paved driveway, heading through some trees and toward a sharp embankment to the road below. I stopped and helplessly watched by beloved 1998 truck and hoping there wouldn’t be anyone driving by on the road below. The truck never made it to the road. Two trees at the edge of the embankment made sure that wouldn’t happen. They stopped the truck cold. I was relieved, but devastated at the same time. The rear end of the truck was severely damaged. The rear bumper and the bed was demolished. After having the truck towed back up to the drive way, I was surprised to find it was still drivable. The whole rear of the truck looked just terrible and the truck shimmed a bit as I drove it up the hill to the inn, but there was hope. Maybe this wasn’t going to be as bad as I thought. Perhaps, just perhaps I could salvage this calamity. I parked the truck as far away from sight as I could so I wouldn’t have to answer or explain what happened to anyone still at the inn, especially the employees. I wasn’t ready for the ribbing that would inevitably occur. For days I wondered what to do. My preference was to remove the crushed bed and build a new flatbed. Even though a friend gave me the basics of what to do, I had never tried anything like that wasn’t sure I possessed the skills to take on such a task. First move was to take it to a body shop for evaluation. They told me insurance would probably total it. They discovered the frame was bent that was causing the shimmy. But I arranged for them to just remove the old bed and straighten the frame. I picked up the bedless truck a few weeks later and again parked it away from where anyone could see it. Looking at it, I realized I had come too far. I had no choice but to build a flatbed, but I had doubts. For weeks I studied on how I could do this. I checked out google and would stare at the truck, talk to some friends and stare at the truck, wake up in the middle of the night thinking about it and then go stare at the truck. Finally at the end of January, when the weather began to warm, I decided to jump in and start something I knew very little about. I worked a few hours at a time and slowly it began to come together. In a week, the bed, with removable side rails was completed. I had not felt such a feeling of accomplishment in a long time. I didn’t want to hide the tuck any longer. I wanted to parade it down Main Street with a band playing “They said it couldn’t be done. They said nobody could do it”. For most men with minimal carpentry skills , this wouldn’t have been a big deal. But for me, it took me out of my comfort zone and even though I didn’t want to admit it, I was proud. Well, I haven’t written a blog in a while and I apologize for not keeping you informed of everything happening around Hemlock Inn. But now is a good time to bring you up to date. We had a good and busy spring and summer. We were blessed with many happy guests and families, many of them returning friends. Spring saw our usual hiking groups and a wedding. This summer, we hosted about 10 family reunions and witnessed the magnificent total solar eclipse with a large crowd of guests. This was followed by a retreat group that has been meeting here for over 30 years. It has been a happy and busy spring and summer. Today is September 1 and the beginning of Labor Day weekend. For us, it is the unofficial beginning of the fall season. Schools are back in session, the temps are beginning to cool, and the pace slows for a while…just a while. Today it is raining, the remnants from Hurricane Harvey. We are not complaining. After the devastation in Texas, we have no right to complain. We feel for the residents of that area and their loss and needs. But we also marvel at the countless responders and volunteers who immediately jumped in to help. Despite of much we are told, America is full of good people and this is just another reminder of how caring we can be. It is just unfortunate we have to have a disaster for this reality to come to light. We do not complain about the rain for another reason. This time last year, we were in the beginning stages of a historic draught that resulted in numerous forest fires in October, November, and December. We had or own disaster and again many many folks who came to our assistance. We are blessed. This fall, we have bountiful rain, green grass, full streams and waterfalls. We are counting on a gorgeous fall color in October and early November. We already have several groups scheduled to visit in late September and early October. In October, we will be the place to be to witness nature’s wonder as the green leaves give way to shades of yellow, red, and brown. It is like our mountains are covered with M & Ms. We have another wedding scheduled and a big crowd for Thanksgiving week. Then there is the Polar Express, the magical train ride to the North Pole to see Santa. We will be filled with happy youngsters and their parents for most weekends in November and December. It is a time filled with joy and laughter. Boy, we all enjoy that. We are waiting for you. Enjoy the season.